~ Baby bunnies are all very cute so picking out "THE" perfect bunny can be an exciting experience for the entire family! While a certain color or look may be tempting, personality traits can make a difference in how you interact with and feel about the bunny several months later. Having a bunny in the family should be a rewarding experience throughout the bunnies lifetime. 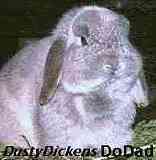 ~ It can be fun to have the bunny follow you around, respond to it's name, walk on a leash or entertain with it's antics. Rabbits are very clean, quiet animals, can be litter trained, are soft, cuddly little munchkins and seem to have personalities somewhat like a kitten at times. ~ Opting for a friendly, calm bunny that doesn't mind being turned onto it's back, having it's teeth checked or having it's toenails trimmed is preferable to the shy or nervous baby. Although either bucks or does can make great pets, in my opinion, a buck might tend to be the better choice, especially if it is to be a child's pet or a house pet with no other bunnies around. ~ It's important that each family member turn the bunny onto it's back each time it is first picked up to be held, from the time it's brought home, to stress your dominance before it starts reaching maturity at around 6 months of age. This practice also tends to calm and reassure the bunny, which usually results in an easy going, enjoyable pet. ~ Most calm bucks rarely spray if they are single pets. Bucks are more likely to be even tempered although many does also remain easy going. Occasionally, little bucks with the run of the house may tend to get a bit possesive of a family member at about 5 to 6 months of age. Some does may become a bit testy at certain times as she goes through her natural cycles if not spayed. In either case, they need to understand that you are in control if this type of behavior should appear. ~ Bunnies which have been raised in loving environments, without abuse, should never attempt to bite! Any bunny showing signs of growling, charging at your hand or displaying other signs of objectionable behavior should be immediately picked up, turned onto it's back, scolded with a firm "NO" and returned to it's cage. Normally, bunnies love to be out mingling with their families so should respond after a few corrections. ~ If you suddenly find yourself with a problem bunny around the age of 6 months, immediate correction may eliminate the objectionable behavior and may aid the bunny in simply outgrowing the behavior with maturity. In a few stubborn cases, where correcting doesn't seem to help, neutering or spaying may be considered and is usually helpful. ~ Personality is always important when chosing any animal to become a part of any family so, hopefully, we will all keep this in mind as a top priority to ensure a loving, enjoyable relationship with our chosen pets. That perfect cuddly bunny can bring you years of heart warming smiles. Thank You For ~ ~ Hopping Through! * This site was developed and intended for educational puproses only. DustyDickens bunnies have never been for sale through the internet and I don't advise buying any bunny without observing it in person and handling it first. In your search for your special bunny, I would recommend checking with your local 4-H Extension Office or ARBA for referrals to local breeders. A pedigree and/or high prices does NOT mean a bunny is show quality! Hopefully, the breeder will keep the best interests of the buyer in mind and only offer quality show bunnies to 4-H and ARBA youth, along with a health guarantee and any assistance needed to help make the experience special and enriching for our wonderful youth.